People are pickling – and it’s not just cucumbers. I’ve seen pickled seeds, fruits and all kinds of vegetables. It goes hand-in-hand with taste trends leaning to bolder, sour, sweet and spicy combos. It’s nothing new. My great-grandma pickled out of necessity, to preserve the summer harvest for cold Minnesota winters. She “never set a table without pickles,” her daughter, my Nana, told me. Nana thought pickles were essential to everyday eating, too. She steamed up her tiny Los Angeles kitchen every summer to make watermelon rind pickles and other preserves. This summer I decided to try pickling. For the August Fig Focus newsletter, I made a quick pickle of dried figs in golden balsamic vinegar with fresh dill, bay and mustard seed. 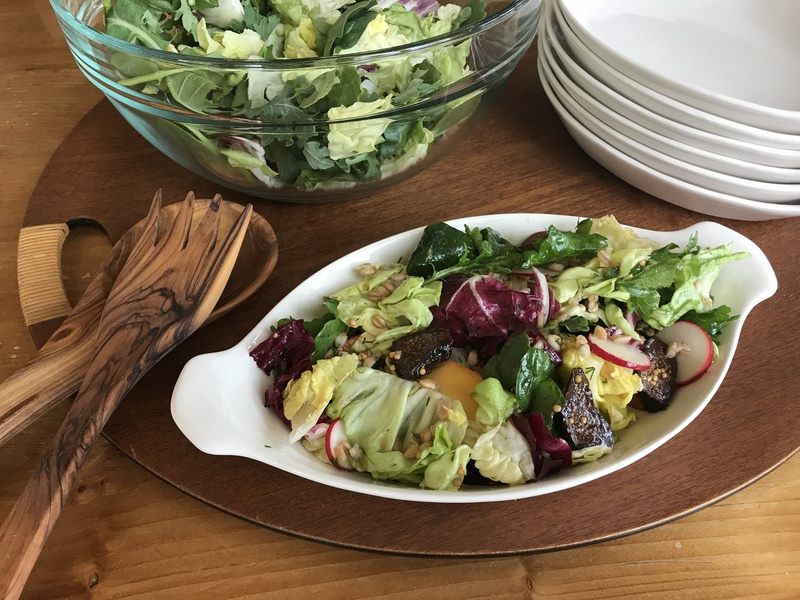 Adding olive oil to the pickling liquid turns it into a salad dressing which is tossed with juicy nectarine slices, radishes and greens. For texture and crunch I add a sprinkle of cooked, nutty-tasting farro grains, chopped pecans and sunflower seeds. 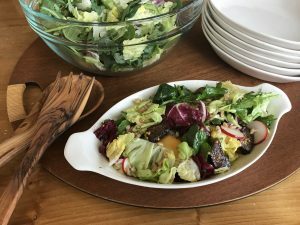 Recipes like this unique and refreshing salad can make consuming 10 (or at least 5) servings of produce every day easy. See my post for Fresh Fruit and Vegetable Month , for more on the health benefits of a produce-rich eating pattern. To make Pickled Figs, trim stems from Figs and discard. Cut each Fig lengthwise into 3 slices. Set aside. In a medium saucepan combine vinegar, water, dill sprigs, lemon, bay leaves, mustard seed, sugar and ½ teaspoon salt. Cover and bring to a gentle boil. Remove from heat, uncover and stir in Figs. Cool, stirring occasionally. Chill for 1 hour. 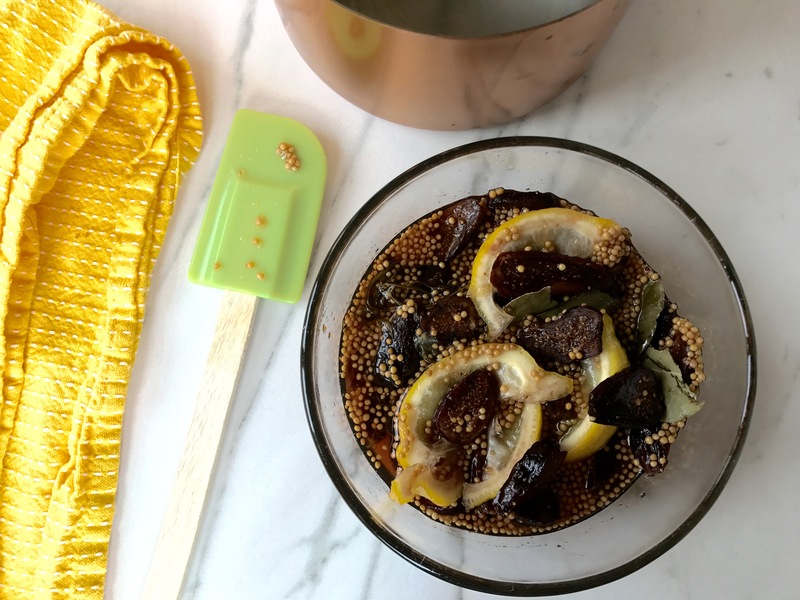 Remove Fig slices from vinegar mixture and set aside. Remove bay leaves, lemon wedges and dill sprigs from vinegar mixture and discard. To make Dressing, whisk olive oil into vinegar mixture. Stir in chopped dill. If desired, add more salt and pepper, to taste. 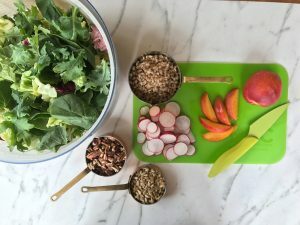 To serve salad, in a large bowl combine greens, pickled Figs, farro, nectarine, radishes, pecans and sunflower seeds. Drizzle dressing over salad. Toss gently. Serve on salad plates or a large platter.